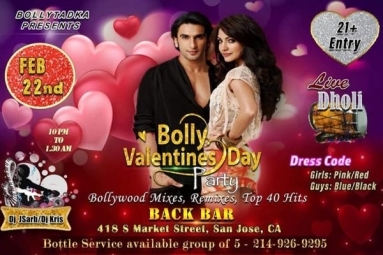 Bollytadka welcomes you to their annual Valentines Day Party. 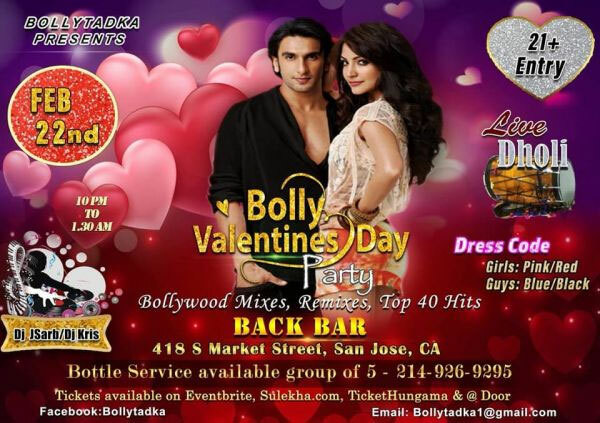 Bollytadka Heat + DJ Sarb Hotness Live in Back Bar on Feb 22nd. Live Dholi- Party Favors- Outside Smoking LoungeAll Die-Hard Bollywood fans, Bollytadka welcomes you to the most happening party of the year. Romance, Drama, Excitement and Craziness on the Dance Floor. Party favors for first come first serve. Limited supply. So make sure you show up as the party begins. We will be there to hand you your favorite valentines favors.